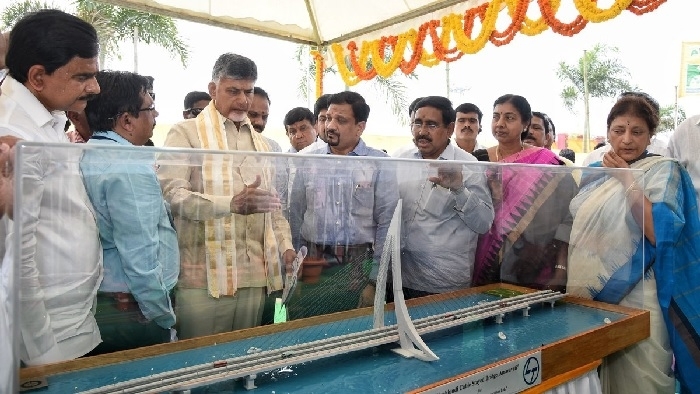 Amaravati, Jan 14: Andhra Pradesh Chief Minister Nara Chandrababu Naidu on Saturday laid the foundation stone for the much-awaited six-lane wide bridge across Krishna river. The mega project will connect capital Amaravati to Ibrahimpatnam. With the budget of Rs. 1,387 Cr, the 3.2 Km long bridge will also reduce the distance between Hyderabad-Jagadalpur National Highways to Amaravati by 40 Km. Addressing the gathering, Naidu said that the six-lane bridge will speed up the economic development in the Western Krishna region. The Chief Minister announced that the iconic project would be named after the world-famous dance form Kuchipudi. He informed that the Iconic bridge would be constructed within 15-18 months.